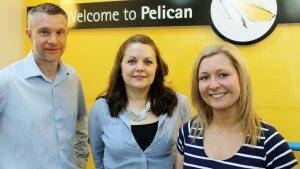 Pelican Communications has appointed three associate directors as part of a long-term strategy to grow the business and secure talent for the future. Rachel Ferguson, Wendy Brown and Will Herman have all been promoted, taking on the roles of associate directors for digital and design, commercial and operations respectively. Pelican managing director, Michael Bennett, said: “We’re delighted to have appointed three of our key staff members to new senior roles. “Will, Wendy and Rachel have all shown great commitment to the business and are ideally equipped to drive Pelican forward. News of the appointments comes as the company has secured three nominations in the Public Relations Consultants Association’s DARE Awards. The company has been shortlisted in the “Integrated Campaign of the Year” and “Trade and B2B” categories for their work in promoting specialist food solicitors, Roythornes, helping the company to win more than £300,000 of new business and become one of the biggest names in the sector. Pelican has also been shortlisted alongside Augmentra in the “Low Budget Campaign” category for their “Walking to Success” campaign, carried out on behalf of ViewRanger, the outdoor discovery app. Originally from Cumbria, new associate director of operations, Will Herman, has worked in a wide range of communications roles for the likes of Natural England, British Gas, Morrisons and ASDA, giving him key experience across Pelican’s key food and environmental markets. As a keen adventure sports enthusiast, he also specialises in the outdoor sector. New commercial associate director, Wendy Brown, has worked across a wide range of financial roles at various businesses across the North West and joined Pelican in 2009. During her time with the business she has project managed a number of successful initiatives, including the implementation of a new project management system. Digital and design associate director, Rachel Ferguson, joined Pelican in 2010. From an agency background, Rachel has excelled in her previous role as senior consultant working on a number of key food accounts and leading the British Frozen Food Federation’s award-winning Cool Cookery campaign. She will continue to work with the BFFF as well as focusing her efforts on growing the digital and design side of the company’s business. Based in Uppermill, Saddleworth, Pelican also recently appointed former Manchester Evening News journalist, Jessica Beckett, and experienced communications officer, Joe Robinson as senior consultants. Current Pelican clients include the likes of Airkix, Arthur J Gallagher, Fowler Welch, Markem-Imaje and Whitby & Co as well as Roythornes Solicitors and ViewRanger.